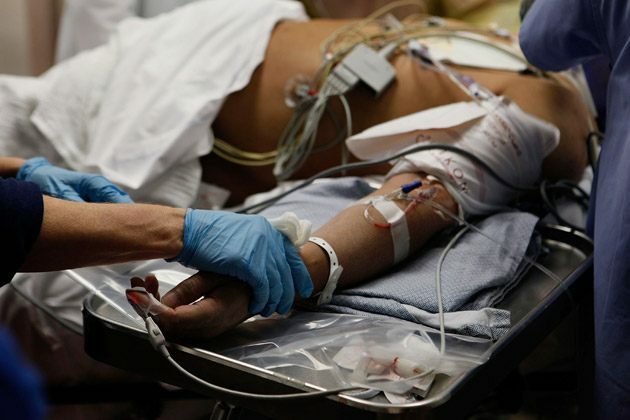 Death of Americans: The Medical System is Now the Third Leading Cause of Death in the U.S. The proper headline for this story should be that the medical system is now the #1 cause of death, killing more Americans than any single disease. The reason I say that is because this report only covers medical errors. So in other words, if you die from a medicine, vaccine, or hospital procedure that was done correctly as prescribed, that doesn’t count. A JAMA report in 1998 found that adverse reactions for properly prescribed drugs accounted for 106,000 deaths a year, and I am sure that number is much much higher 15 years later. The cure is worse than the disease: The medical system is the #1 cause of death in America today. It seems that every time researchers estimate how often a medical mistake contributes to a hospital patient’s death, the numbers come out worse. The new estimates were developed by John T. James, a toxicologist at NASA’s space center in Houston who runs an advocacy organization called Patient Safety America. James has also written a book about the death of his 19-year-old son after what James maintains was negligent hospital care. Asked about the higher estimates, a spokesman for the American Hospital Association said the group has more confidence in the IOM’s estimate of 98,000 deaths. ProPublica asked three prominent patient safety researchers to review James’ study, however, and all said his methods and findings were credible. What’s the right number? Nobody knows for sure. There’s never been an actual count of how many patients experience preventable harm. So we’re left with approximations, which are imperfect in part because of inaccuracies in medical records and the reluctance of some providers to report mistakes. Patient safety experts say measuring the problem is nonetheless important because estimates bring awareness and research dollars to a major public health problem that persists despite decades of improvement efforts. “We need to get a sense of the magnitude of this,” James said in an interview. James based his estimates on the findings of four recent studies that identified preventable harm suffered by patients – known as “adverse events” in the medical vernacular – using use a screening method called the Global Trigger Tool, which guides reviewers through medical records, searching for signs of infection, injury or error. Medical records flagged during the initial screening are reviewed by a doctor, who determines the extent of the harm. In the four studies, which examined records of more than 4,200 patients hospitalized between 2002 and 2008, researchers found serious adverse events in as many as 21 percent of cases reviewed and rates of lethal adverse events as high as 1.4 percent of cases. By combining the findings and extrapolating across 34 million hospitalizations in 2007, James concluded that preventable errors contribute to the deaths of 210,000 hospital patients annually. That is the baseline. The actual number more than doubles, James reasoned, because the trigger tool doesn’t catch errors in which treatment should have been provided but wasn’t, because it’s known that medical records are missing some evidence of harm, and because diagnostic errors aren’t captured. An estimate of 440,000 deaths from care in hospitals “is roughly one-sixth of all deaths that occur in the United States each year,” James wrote in his study. He also cited other research that’s shown hospital reporting systems and peer-review capture only a fraction of patient harm or negligent care. Dr. Lucian Leape, a Harvard pediatrician who is referred to the “father of patient safety,”was on the committee that wrote the “To Err Is Human” report. He told ProPublica that he has confidence in the four studies and the estimate by James. Members of the Institute of Medicine committee knew at the time that their estimate of medical errors was low, he said. “It was based on a rather crude method compared to what we do now,” Leape said. Plus, medicine has become much more complex in recent decades, which leads to more mistakes, he said. Dr. David Classen, one of the leading developers of the Global Trigger Tool, said the James study is a sound use of the tool and a “great contribution.” He said it’s important to update the numbers from the “To Err Is Human” report because in addition to the obvious suffering, preventable harm leads to enormous financial costs. Dr. Marty Makary, a surgeon at The Johns Hopkins Hospital whose book “Unaccountable” calls for greater transparency in health care, said the James estimate shows that eliminating medical errors must become a national priority. He said it’s also important to increase the awareness of the potential of unintended consequences when doctors perform procedure and tests. The risk of harm needs to be factored into conversations with patients, he said. Leape, Classen and Makary all said it’s time to stop citing the 98,000 number. Still, hospital association spokesman Akin Demehin said the group is sticking with the Institute of Medicine’s estimate. Demehin said the IOM figure is based on a larger sampling of medical charts and that there’s no consensus the Global Trigger Tool can be used to make a nationwide estimate. He said the tool is better suited for use in individual hospitals. The AHA is not attempting to come up with its own estimate, Demehin said. Dr. David Mayer, the vice president of quality and safety at Maryland-based MedStar Health, said people can make arguments about how many patient deaths are hastened by poor hospital care, but that’s not really the point. All the estimates, even on the low end, expose a crisis, he said.